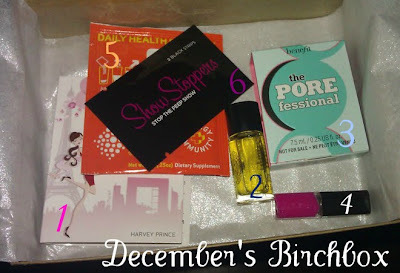 Disclaimer - I am not affiliated with Birchbox (or any of the product brands featured in this post). I have not received compensation for this post in any form (monetary, or otherwise). I pay for the subscription, and all opinions voiced on this blog are strictly my own. #1 - The Ageless perfume smells fruity and feminine without being overpowering. The designers created it with ingredients that counteract the scents of aging, so I'm not really sure why they sent it to me (unless the consider 30 old). PS. What exactly are the scents of aging? #2 - Orofluido Elixir smells BEYOND amazing. I can't stop sniffing my hair, which I'm sure looks pretty weird. It was also my favorite sample this month, but I must say... Birchbox can chill out with the hair serum now. I understand my hair is thick, coarse, and nappy, but I've received enough serum samples to tame it down for 20 years. #3 - I haven't used the POREfessional primer yet. My skin has forgotten that I'm 30 and now thinks I'm 16. It's been Breakout City, and I'm scared to try anything new that might cause it to breakout. I'm eager to try this though; it just might be a while. #4 - I haven't used the Jouer product yet either. Along with the many serum samples, I've also received a ton of lip gloss. All of them are some shade of hot pink, and quite frankly, I'm not a fan. #5 and #6 - As far as the extra samples are concerned, I could care less about the double-sided tape because I rarely wear anything that would require me to use such a thing, but I'll definitely try out the EBOOST Orange Natural Energy Booster. I'm a fan of EmergenC and I think it's similar to that. What did you receive in YOUR Birchbox this month? Just came across your blog & we're now following! We'd love for you to visit ours sometime too. We have a new giveaway posting tonight, so be sure to enter! 4.Porefessional- this stuff is so so amazing, I'm buying a full size one, but the little one will last a while. I got the pore professionals and I can't wait to try it!